Being the first of his films that we had the chance to see back in the good old days when video stores ruled our worlds, the renowned biographical drama Raging Bull is the reason we fell in love with the work of Martin Scorsese. A film that Ebert, Siskel and many others considered the high point of the 1980s American cinema, this is an intensive story of a talented boxer utterly destroyed by his inner demons, featuring a perfect performance from one of the untouchables, Robert De Niro, memorably helped by Joe Pesci and Cathy Moriarty. Raging Bull brings us the fascinating rise and fall of Jake LaMotta, based on the Italian-American boxer’s memoir Raging Bull: My Story. Written by Paul Schrader and Mardik Martin, presenting phenomenal black and white cinematography by Michael Chapman, this stunning mixture of violence, anger, jealousy and resentment was nominated for eight Academy Awards, of which De Niro and the brilliant editor Thelma Schoonmaker went home with statues in their hands, and ultimately went down in history as one of the true peaks of American filmmaking. It certainly goes without saying that Raging Bull turned out to be a vital stepping stone in the growth of Martin Scorsese, a crucial step on his path towards cinematic hall of fame and massive respect he still enjoys in the cinephile community. The screenplay for Raging Bull is ranked #76 on the WGA’s list of the 101 greatest screenplays. Dear every screenwriter/filmmaker, read Paul Schrader & Mardik Martin’s screenplay for Raging Bull [three different drafts: PDF1, PDF2, PDF3]. (NOTE: For educational and research purposes only). The DVD/Blu-ray of the film is available at Amazon and other online retailers. Absolutely our highest recommendation. Raging Bull began as Robert De Niro’s obsession, but the only man he believed could film it, Martin Scorsese, wasn’t interested—until the director’s near-fatal collapse gave him a visceral connection with the story of troubled boxing champion Jake LaMotta. Three decades on, Richard Schickel tells how one of Hollywood’s great friendships, forged by Mean Streets and Taxi Driver, drove Scorsese’s finest film. Scorsese just couldn’t understand De Niro’s enthusiasm for this story. Mardik Martin, who was a friend of Scorsese’s from N.Y.U.’s film school and co-author of the Mean Streets screenplay, thinks that, at this point, Scorsese had done no more than riffle through the book. Born in 1942, the director had been a little kid (and already a committed movie geek) when La Motta was at the top of his game. “I didn’t know anything about boxing,” Scorsese says. “It was always one angle on TV or in the movie theaters, where they’d show the fights on the weekend. I didn’t know what the hell was going on. It was sports, which took me out of the picture.” Still, he agreed to help develop the project with De Niro, though without much passion or focus. By the time of De Niro’s hospital meeting with Scorsese, Mardik Martin had written at least one draft of the screenplay, with very little input from Scorsese. Raging Bull cinematographer Michael Chapman discusses his groundbreaking B&W camerawork on the landmark film. Chapman has had a huge influence on contemporary filmmaking, working on an impressive array of classic films including Taxi Driver, Raging Bull, The Lost Boys and The Fugitive. You can watch the complete interview here. 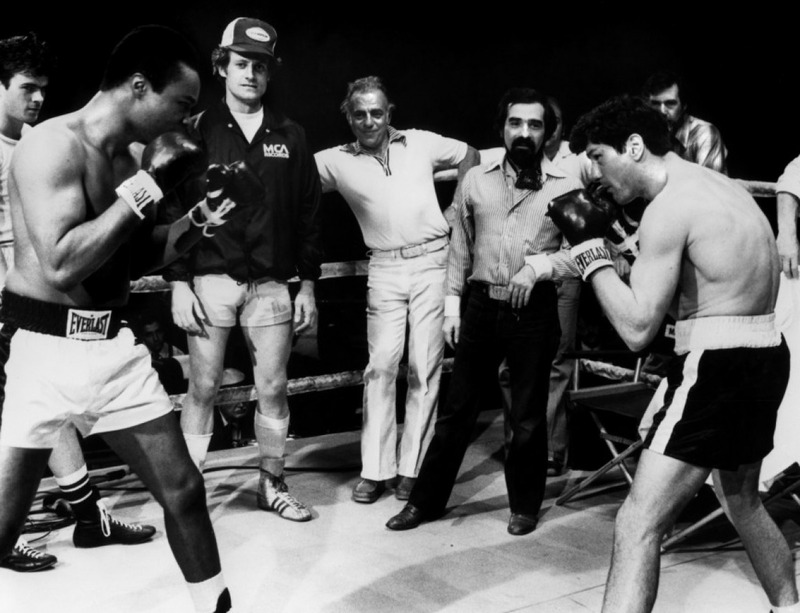 Above: Michael Chapman uses a handheld camera to get the POV of LaMotta’s punch. 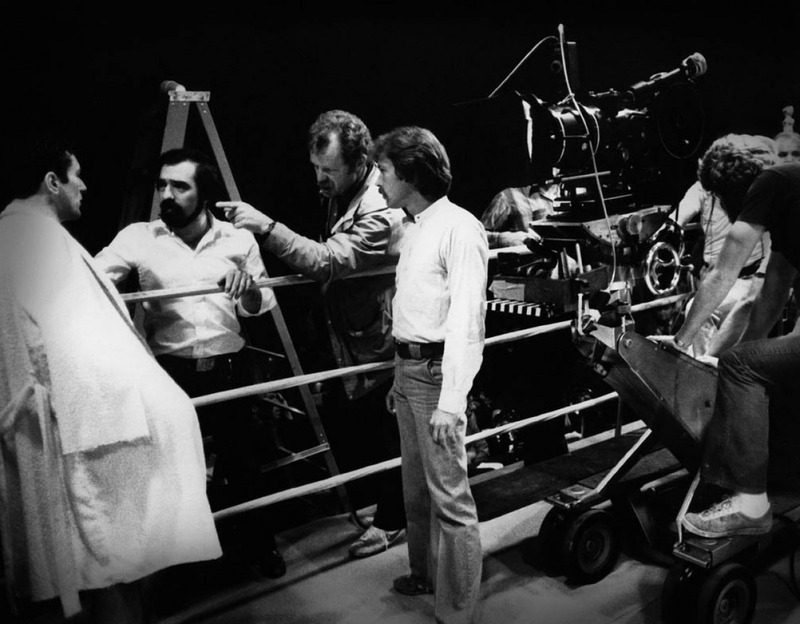 Below: Chapman rigs the camera to Robert De Niro’s body for one of the fight scenes, courtesy of Will McCrabb. Screenwriter Paul Schrader’s outline for Raging Bull. Test polaroids of De Niro as he tries to perfect LaMotta’s look by stuffing cotton in his nostrils. This page is one of dozens of make-up tests, all of which attest to De Niro’s obsessive devotion to minute details. Images courtesy of The Robert De Niro Collection, The Harry Ransom Humanities Research Center, The University of Texas at Austin. A multimedia presentation on the creation of this exhibition can be found here at the Ransom Center’s Web site. Additionally, here’s a transcription of some of the highlights, courtasy of Indiewire. One particular Powell and Pressburger film, The Life and Death of Colonel Blimp, greatly influenced Raging Bull. “De Niro was fascinated by the film and how convincing the weight gain was, and pummeled Michael Powell with questions of how he did it.” Powell used make-up and doubles with actor Roger Livesay, but “this was not the kind of thing that De Niro would ever agree to,” no matter how much Powell objected to De Niro gaining weight. Scorsese usually uses two cameras for improv scenes between actors, but a scene involving Jake and Joey arguing about losing weight in the kitchen made this impossible due to the small space. “It took almost a month for me to wrangle the footage into shape… and it was extremely hot and the babies kept crying.” Schoonmaker also showed a funny outtake in which Pesci and De Niro try to keep their concentration and keep the babies from fidgeting or crying, with great difficulty. Here are several photos taken behind-the-scenes during production of Martin Scorsese’s Raging Bull. Still photographers: Brian Hamill & Christine Loss © Chartoff-Winkler Productions, United Artists.